I made myself a yummy tostada or fried green plantain for lunch this week. The delicious topping was this Guacamole and shrimp. I enjoyed it very much and hope you do too! Heat the olive oil in a medium skillet over medium heat. Add the garlic and cook for 2 minutes stirring often. Add the shrimp, paprika, cumin, salt and pepper and cook for about 2 minutes on each side or until the shrimp are cooked. 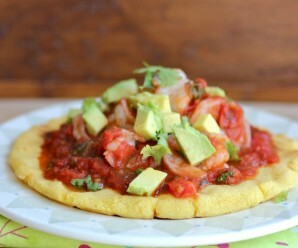 To serve: Place the tostada on a serving plate, spread ½ cup of guacamole and top with 6 shrimp. Place lime wedges on the side to drizzle on to of the shrimp. I would love to have that as a lunch too! How delicious! I have always wanted to learn how tom make tostadas like this so thanks for sharing. I also like your guacamole recipe! Erica I love your recipes. Are you no longer living in Colombia? ?Where are you now?Hope you are having a nice weekend. Thanks for the lovely recipes and photos. Thank you so much for your wonderful comment! I moved to the United States 10 years ago. 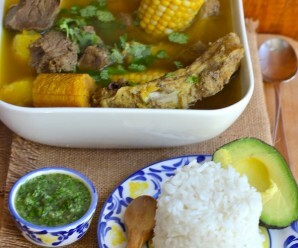 Yum this looks delicious, although I have never eaten plantain before. Erica although I did’nt know ANYTHING about columbian food when I first came to your website, you have thought me SO MUCH. 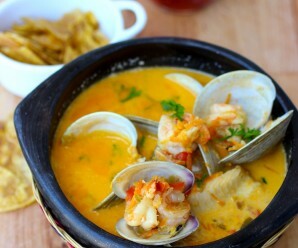 I am now entertaining the notion that Columbian food is extremely delicious and sooooooo pretty too. Most of all, thanks to your recipes I have a chance to try making these at home. This is so gorgeous …REALLY ! Anything with plantains, shrimp AND guacamole has got to be phenomenal. I cannot wait to try. Thank you everyone for the comments! I love tostadas…..they are absolutely delicious! I love your recipes! But please remind all of Non COLOMBIANS that is is NOT ColUmbian food…or ColUmbian coffee, it is ColOmbian food, ColOmbian coffee! ColUmbia has Nothing to do with ColOmbia other than kind of the sound or the spelling. The letter O makes a big, BIG difference! Changing the subject here, this recipe looks so yummy! 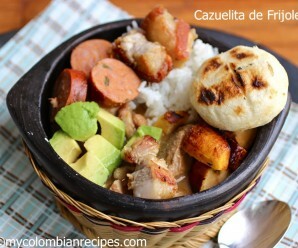 How do I make the plantain? It is huge! Thanks for the taking the time to share this wonderful food!